After our late ferry and even later time parking up for the night, we didn't get up until about 9am! We had a leisurely breakfast and went for a walk over to the beautiful lake we had camped next to. Our first morning in Norway! The problem with visiting a place you have read and heard so much about is deciding where you want to go! I'd added a few things to our map, but we didn't have a routine or itinerary, other than we needed to be in Trondheim in 10 days to collect Jade from the airport. The weather was incredible- baking hot and clear blue skies for miles. Most ‘un-Norway-like'. We decided to head towards Preikestolen, a huge rock you can climb with stunning views over the fjord. 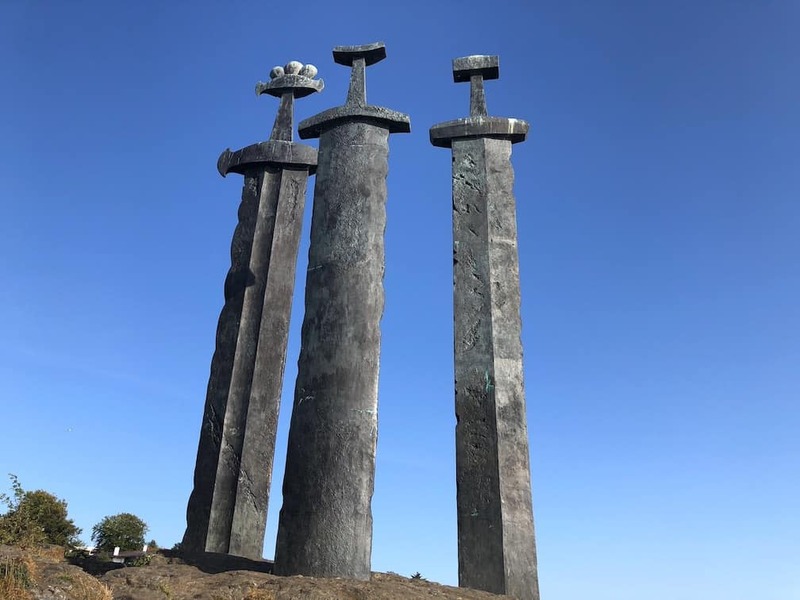 On the way, we swung by Stavanger… or more accurately, we swung by the swords in the rock! This is the place where Norway became one Kingdom under Harold Fairhair (love that name!) The swords are cast in bronze and symbolise peace, unity and freedom. The hilts are all different and are based on swords found in different parts of the country. Apparently, Harold Fairhair defeated the other kings of Norway and unitised the country. Historians think this happened in 872… but could easily have happened up to 10 years later. And, as usual, the whole thing was over a woman. Harold was in love with Gyda… who refused to marry him until he became more powerful… *seems like a solid, strong foundation for marriage*. So he decided to wage war on his countrymen and wipe most of them out. The story never says if they were happily married or not! Either way, it's a stunning monument. It's totally free to walk around and there is a field and a small beach where you can swim in the fjord. We found parking a bit difficult, because we're so long, but eventually we found a layby a little further down the road and walked back to the swords. Another fun fact- this fjord, Hafrsfjord, is only 3.5m deep at the deepest part, keeping it safe from big ships. We did a fair amount of driving today- over 150 miles from Kristiansand to Stavanger. We contemplated visiting the rest of Stavanger, as we've heard it's a very pretty place, but we decided to save our city explorations for later. Now we're off to find camping near Preikestolen. (Pulpit Rock) If you'd like to know more things to do in Stavanger, this great guide will help. To get to Preikestolen, we need to get on our first ferry. We went from Luavika to Oanes and it cost us 358 NOK for a 9.9m vehicle with 2 adults. The ferries in Norway are simple to use. You pull up (CHECK you are in the right lane as often there are 2/3 ferries all going to different places! ), a lovely person who so far has always spoken excellent English comes along, asks how long your vehicle is, asks how many people are onboard (only one is included with the vehicle) and charges you appropriately. You can pay on card, though not American Express. As far as I can tell, the cost for length has 4 categories (up to 6m, 6-8m, 8-10m and over 10m), although there may be more. Once you have paid, you wait in line for the ferry to arrive, then file onboard and enjoy the crossing. You can get out of your vehicle to enjoy the views and most ferries have a cafe or vending machine onboard (usually inside the main section). They run regularly between about 6am-11pm and there are often ferries later into the night but we haven't tried them out yet. Wanda waiting for her first ferry in Norway!